My cousin, Dear MYRTLE, made a comment on Facebook about the Civil War and that she and Mr. Myrt were watching a program on Gettysburg. Last night, I found a link to a program on Gettysburg online, so I decided to watch this 88 minute program. What I didn’t realize, until about 50 minutes into this program, that I had seen this program before. I knew that I had from how the program was done, but didn’t connect the dots as to what this program was about. “Ridgely Howard” was mentioned, as a 33 year old, slave holder from Baltimore and that his grandfather served with George Washington during the War of Revolution, and that this family was of the “plantation class”. I know this guy. I spend a summer researching Ridgely Howard trying to find out who he was. There may be a couple of blog posts in that series that is not about this research, but about the 3rd blog post is the end, at that time, of my search. 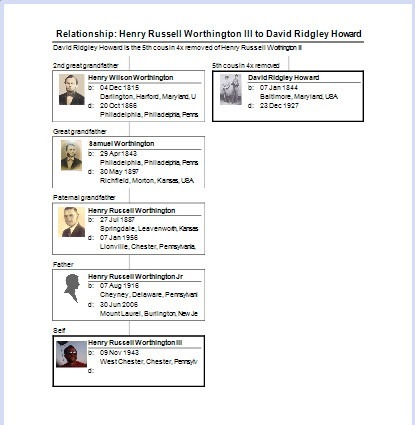 It turns out that David Ridgely Howard (1844 – 1927) was my 5th cousin, 4 times removed. 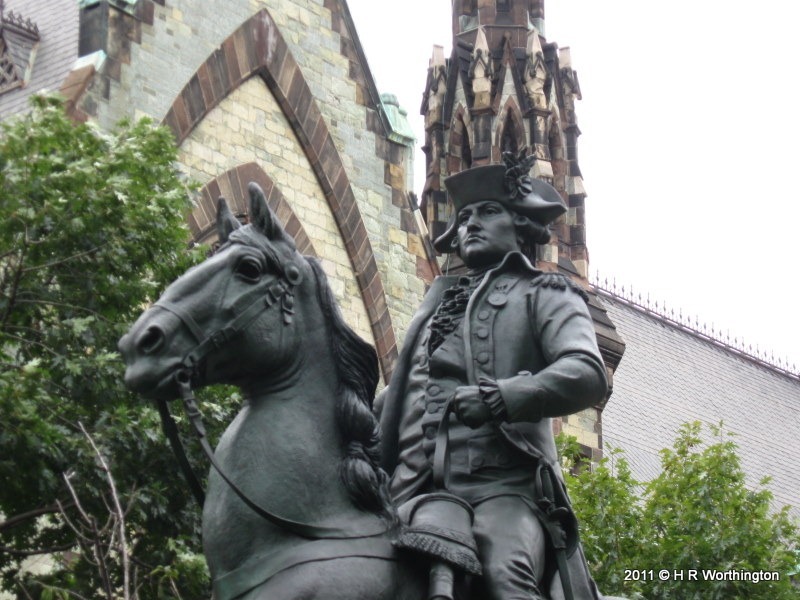 I was reminded about James Wallace, whose grandfather served in the same regiment as did Ridgely Howards grandfather with George Washington. What I didn’t catch the first time, was that David Ridgely Howards house has been reported to be haunted. I’ll have to look into that. After Ridgely was wounded, on this day, in the morning of 3 July 1863, he would return and be wounded a second time, but this time he lost a leg. The amazing thing is that he lived until 1927. Genea-Blogger, Randy Seaver, each and every week, posts a blog about Saturday Night Genealogy Fun. It’s Saturday Night again — time for some Genealogy Fun (what else is there to do on Saturday Night?)!! 1) Decide which of your (many?) genealogy research adventures in 2011 was your “very best” (your definition). 2) Tell us about it in a blog post of your own, in a comment to this blog post, in a Status report or comment on Facebook, or in a Stream note on Google Plus. Well, I can do this one. My very best was the study I did on Inferential Genealogy, a method of study by Dr. Thomas Jones. This was the outcome of studying Inferential Genealogy in Second Life, with that awesome group of people. Besides the trip to the Civil War Museum in Harrisburg, several trips to Gettysburg, several other trips to Baltimore, I was able take a Name, mentioned in a PBS TV show, and find out how I was related to that Civil War Hero (David Ridgely Howard). Along the way, found another connection to DearMYRTLE, a couple of days spending time with she and her husband, only to find that he and I had Revolutionary War gentlemen in the same unit at Valley Forge. There is a PS: to this story. Over Christmas, the Gettysburg show on PBS was reshown. The kicker is, that at the very end of the discussion of Ridgely Howard (as they called him and where I started), was mention that his house was haunted. Its been a while since I updated this project. Haven’t stopped, but have taken a break. In the mean time, I have been working on a Brick Wall for a Genea-Blogger, Randy Seaver. His “Brick Wall” came about the two of us using our favorite genealogy software. I have blogged about that on my Family Tree Maker blog. This blog post is not about software, but a Road Trip I just returned from to address this brick wall. Basically, Randy is looking for the Parents of Willam Knapp (1775 – 1856). So, why am I interested? Easy, my wife has Knapp’s in her ancestry, and we have visited more than one cemetery looking for and at Knapp headstones. To put this into perspective, I mapped out the Birth, Marriage, and Death Location on a Map. Consider: Birth 1775, Dutchess County, NY; 1804, Woodbridge, New Jersey; 1856, Newton, New Jersey. I do NOT challenge or question any of Randy’s research. It is awesome. I have learned a couple of things from his research. My advantage, maybe, that I know these places. By car, mostly interstate, between Dutchess County and Newton is over 2 hours today. But to through in a 3 hour “detour” to Woodbridge, in the 1800’s, leaves me with some questions. 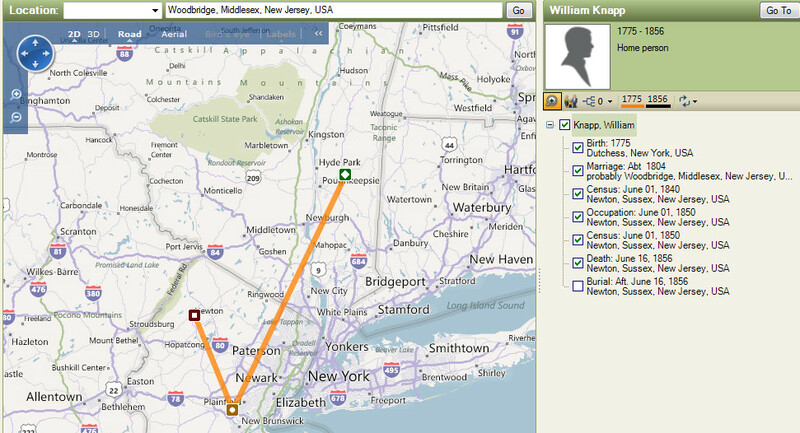 We have tracked my wife’s ancestors between the two end point a couple of time, no detours, didn’t pass go to collect our $200.00 and it’s on one road Route 94, in both New York and New Jersey. The cemetery visits were along that road. Goshen, mid-way is full of Knapp’s. More questions. In reviewing Randy’s notes, included a comment about Dutchess County. I had one perspective of Dutchess County based on today’s maps. Not questioning the “starting” point for William, but to make sure I was looking at the Right Starting point. The pin-point on the map is close enough (for government work). Putnam County is a county located in the U.S. state of New York, in the lower Hudson River Valley. Putnam county formed in 1812, when it detached from Dutchess County. OK, so now the “starting point” just grew a bunch. The good news, more places were we have found Knapps, the Bad News, more Knapps. I need a (K) nap (p). From my earlier experience with Baltimore, I had to get into my head the territory. (there’s a song in there somewhere). I bribed my wife into taking a road trip to see if we could find any of her Ancestors. She agreed and she took some research notes with her. That’s another story. I did some looking at Find-A-Grave before we left. I knew that the Dutchess Genealogy Society / Library was closed today, but that was OK. I wasn’t sure where to start in Dutchess County (current county) but figured that where ever that library was, would be a good start. Find-A-Grave gave me a bunch of Cemeteries. Searched for Dutchess County for Knapp, found over a hundred possibilities, looked closer at a couple of “big hitters”. That is, a bunch of Knapps, but with 1700 headstones. Not looking for William, but perhaps a sibling, if there are any, or some other names to look for, trying to back into William’s family. Perhaps a book store or historical society looking for clues. The clue there was to find out why William might have left Dutchess County, to head south to meet his wife. Have read some of the history of her family trying to find out if she had been somewhere before she ended up in Woodbridge. That wasn’t the case, in fact she had pretty heavy times to that area and Hackensack, New Jersey where she returned to after her husband died. So, at this point, William went south, but why. More questions. Found an old book store, Nothing, zip, zero, Oh well. On the way to the first cemetery, we ended up on a road “New Hackensack Road” in New York. Not too far down that road was NY State Route 94. OK, what’s going on here? Came to the first cemetery, Bethel Baptist Church of Shenandoah Cemetery. Small and very nice. 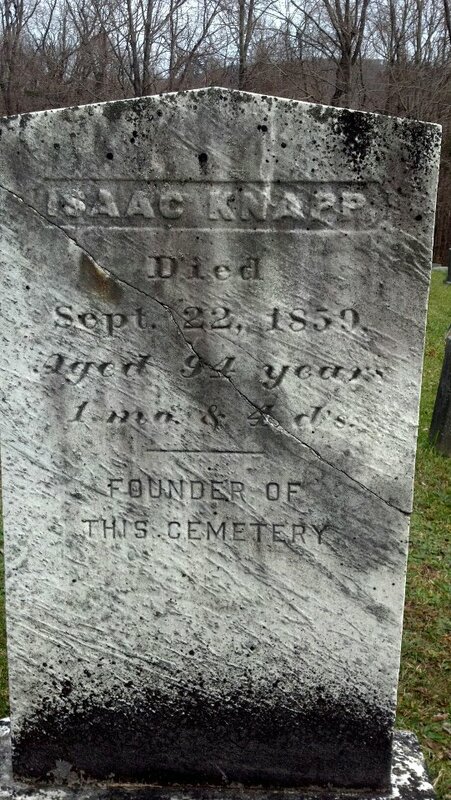 My Find-A-Grave printout said there were 42 interments there, most that have been posted were, in fact, Knapps. From the parking lot in two directions, you could see Knapp headstones. I usually try to find the history of a Church if there is one. There was a car in the parking lot, but nobody was home. Ran down my first set of batteries, had to go back to the car for the back up, and on my way back for more pictures. the Pastor of the Church walked to his car, and wanted to know if he could help. History? nope, BUT … like that word … but “I know someone who does”. Actually he gave me two names. He pointed me to a Headstone, which is where I was headed back to, and one of the names used to be the Historian for East Fishkill, which is not far from where we were. AND (more good news I hope) he is a genealogist. Quick Email to Randy for “future reference” and posted a picture to Facebook. 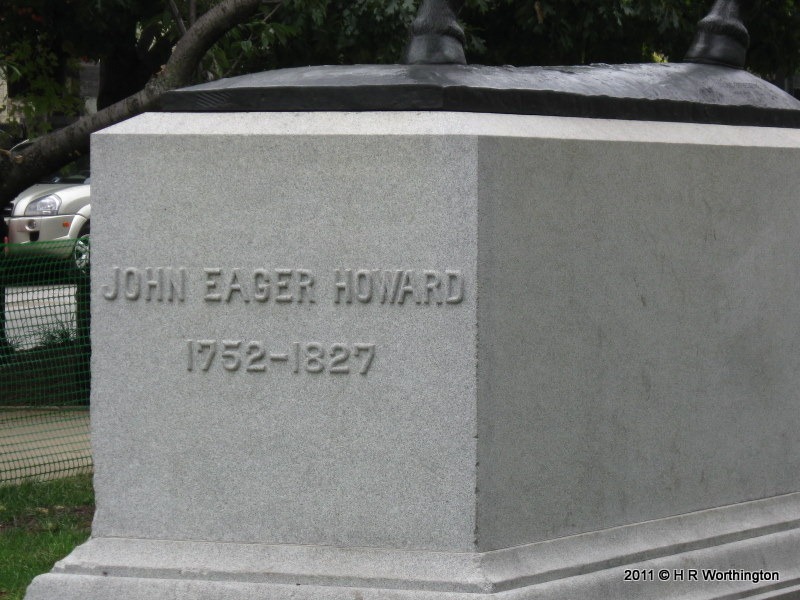 OK, so he died in 1859. I wonder. Although that is where we are right now, but I just found a couple of other bits and pieces to look for. On the trip to Poughkeepsie, I was expecting to find a Negative Source. Some hint as to why Randy hasn’t been able to find any information. But, I know have a contact who might be able to shed some light on why can’t we find William Knapp, any historical event (like a burnt court house) that causes us not to be able to find any records, why would young Knapp go down to New Jersey? The term “I know a guy” has been running through my mind on the return home from this trip. Lesson Learned: Keep looking. Look sideways (look for siblings or descendents of siblings), Ask a local Historian; Keep asking questions. I have the questions, but may have found someone with an answer or two. 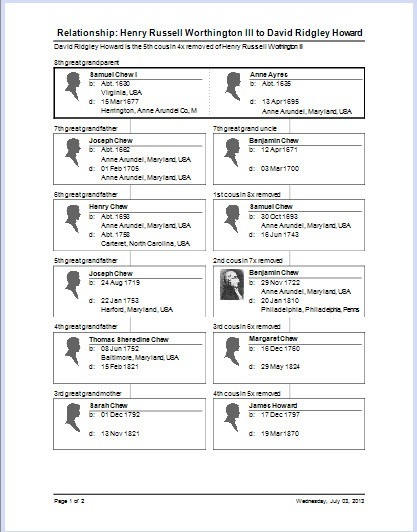 As you may have guessed by now, most of what I have been doing is inputting all of this collected information into a Genealogy software package. There are many choices, but I have been using the Family Tree Maker program for a number of years. I have shared a couple of outputs from that program for this project, and here is a link to another feature I used. 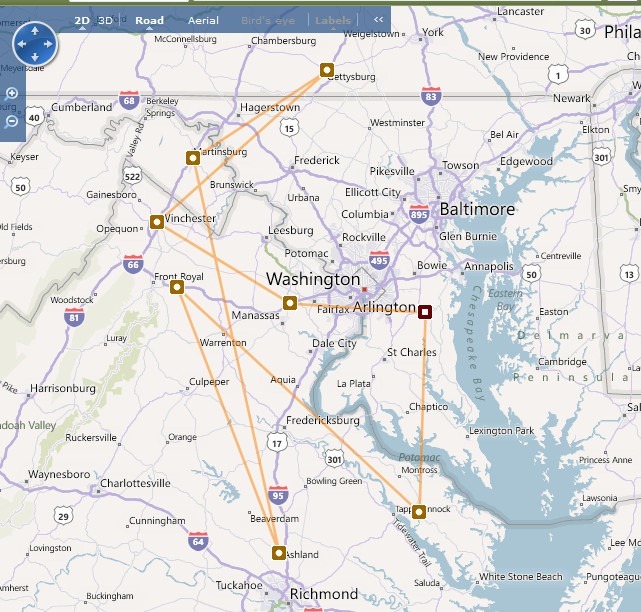 What was demonstrated in that Blog, was how I created a Map of the various battles that the 2nd Infantry Regiment, Maryland fought in. Each of the squares is a battle location. In the database is details on each of the battles, but this gives me an idea of how far they traveled. I just posted the results of looking at another Record Set (Exhausted Research) for this project. This time, it was on the military unit the David Ridgely Howard Served in. Instead of duplicating the blog, here is a link to the blog post. The point of this, for me, was to have a view in the Ancestry Member Tree, and in FTM2012, an overview of this Civil War Regiment. When reviewing my Civil War hero, and his dates, I have a good idea what battles he fought in. He enlist on August 21, 1862, but into the 1st Regiment Maryland, so would have been in the initial organization of the 2nd Regiment. He was wounded on July 3, 1963 at the Battle of Culp’s Hill. This would have put him at the battle of Centreville and Winchester, Virginia and the first day’s battle in Gettysburg for this unit on July 2. He missed the Battle at Martinsburg, but returned to the battle at Cold Harbor, Virginia. 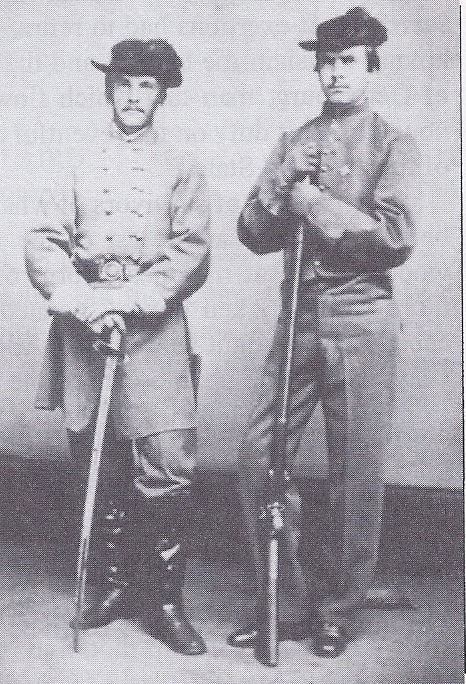 He was wounded on the 2nd date’s battle at Weldon Railroad, Virginia and would be out of the rest of the war, as he lost his leg in Weldon Railroad battle. I was reminded that I haven’t talked about one of the tools that I have used for this process. Dr. Jones talked about it, and the 2nd Life Study Group talked about spreadsheets. I happen to use EXCEL after working with it for a number of years. Not sure how clear this will be for the Blog, so I will try to explain it. The next three columns are Last Name, First Name, Middle Name, as it appeared in the Census Records. Census records are reflected in the 5th column lasted as the Residence Fact. That fact has the Census Year, the State, the County / City and the jurisdiction within that city. Here we are talking about Baltimore Maryland. So, the next to the last column will reflect what is on that Census Record. The last column is the House Number of the Family Number. Using filtering and sorting this really helps show households for a given Census Year. In this example each of the people with red boxes around 1900 Maryland Baltimore Independent City / Ward 13 House # 939 were folks living at that location. In the example, based on the dates, two brothers, and a wife are in that household. There are others in the spreadsheet, but just showing the example. To keep track of the Females in the file, I used the Yellow Hi-lite to remind me that this name is a female. I wanted to stand out, when doing searching in the Census. If I don’t know a Persons Name, First or Last, I use 5 Underscores. It’s a visual indication that “I don’t yet know the persons name”. You can see that I don’t know the female (Elizabeth W) birth surname. But, I know that she was married in 1875 to Charles Howard, the gentlemen listed above her name (clearly by accident). When she got married, I then knew to look for Elizabeth Howard in the 1880 Census. BUT, I wanted to keep in mind that I still didn’t have her birth Surname, so when a Female gets married, I move her birth surname to the column after her middle name or initial. The Birth, Marriage, and Death Dates are important. So they are tracked, but using their complete full name for the Birth and Death information. Visually, it shows the start and end of a persons information, along with the Person’s ID. I know that I don’t have to look for Elizabeth in the 1910 Census, because she died in 1906. But, I can also tell that I need to look at the 1910 census as the three people listed here have blanks in those census years. As this was developing, I had been tracking everyone in the file. But at this stage of this file, keeping my goal in mind, I only focused on what I now know to be two brothers and their households. Looking at the Census Records are one thing, but to be able to step back, using a spreadsheet, I have been able to see how these households “stuck together” over time. Then to be able to realize that the households were in the Same Block or just down the street, as was seen in the Maps that have been posted here. Working with this spreadsheet has been very helpful in resolving some of the conflicting information that I ran into and resolve in the past couple of days. Learning: Learn to use some basic sorting and filtering that is available in a spreadsheet. PS: I was able to generate data from my genealogy program when I wanted to start using a Spreadsheet. I had not started to us it, until I went through the video that Dr. Jones made available to us, and the 2nd Life Study Group talked about it. But like setting a goal for this project, it took a bit to figure out how to use this tool to my advantage. Not to try to track everyone, but to be focused on what the tool was going to be used for.